Earlier this year, in January, my mentor from Canada was visiting me to teach another seminar in healing. At the time, it was so cold in Canada that the roads near her home were shut down. There were news reports that even made it down to Atlanta about people getting stuck in their cars up near her home due to the snow and ice. I wondered how so many people could survive in their cars, and I could only imagine what basic necessities people in Canada must have to carry with them just in case of such emergencies. Blankets, lights, rations. An extra source of heat? My friend from Canada hardly knew what to say to my friend from Atlanta. I mean, seriously! I once asked my friend from Canada how they get through the winters up there. “We just give ourselves permission to rest,” she told me. When the roads are iced over, she just stays home, makes a fire and reads a book. You just don’t fight it. You make peace with the fact that it’s going to be freezing cold and you simply make other plans. It’s not a surprise that it’s going to be solid ice everywhere. You don’t get upset about it. You learn a hobby like she did, quilting, and you learn how to make yourself happy with peace and quiet. In the healing work that I do, one of the things that sometimes comes up for people is are they actually living in balance with the seasons of their soul. When winter comes, we are meant to hibernate. It’s a time of deep inner reflection. If we are still fighting it and expecting it to be spring or summer or even fall, we are going to be sorely disappointed. Every time of our life has its own riches. The time of silence is a time to be intimate with ourselves. This is a time when we get to know ourselves as we are, totally unencumbered, totally unadorned, just as the trees have shed their leaves. Aging is like this too. In our youth, we can convince ourselves that we are our trappings. We think we are our job, our job title, the money we make, our salary, our kids, our relations. We can think of all these things that supposedly define us but that are not really who we are. In the winter of our lives, we know ourselves as soul. We make peace with our emotions, with our mistakes, with our missed chances. We make peace with what we have harvested from life and allow all that we have learned to get us through until the light of spring comes again. If you have mastered all the seasons inside yourself, you can live in balance and weather whatever comes, whether it’s happy or sad, easy or extremely taxing. One way to practice being in balance at the soul level is to be in tune with the seasons of nature, not fighting it, but finding the peace and the joy and the gifts of each time of year. I am at peace with my preparations for winter every time I look at the firewood stacked neatly under my house. I figure I have enough to last me, at least for this winter. I wonder about next year, but I am pretty sure I am good even if I lose electricity. Just this weekend, a friend helped me remove my beautiful blue ceramic fountain from my garden, since it is expected to freeze over this week. 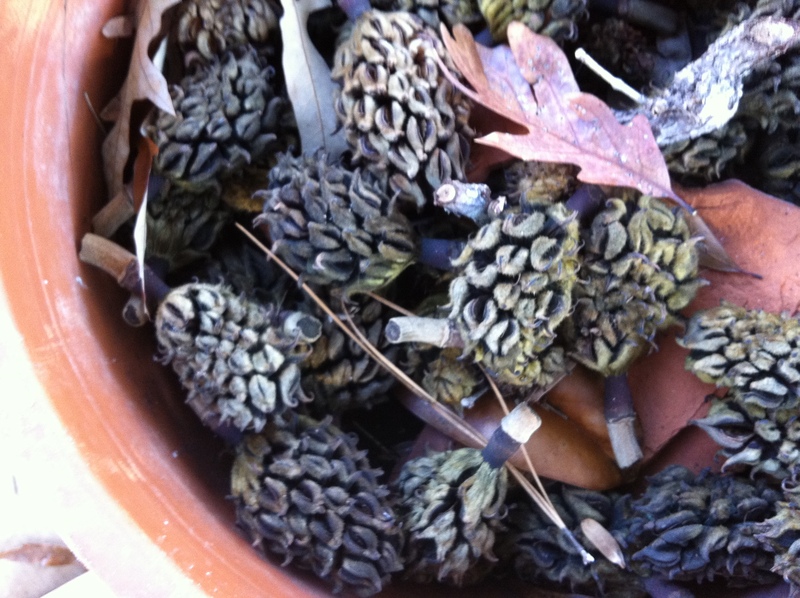 I set it aside under my back porch so that it will be safe until spring. My garden looks more bare, even though my apple blossom double begonias are still blooming. I dread the day I will look out the window and their pink blossoms will be all gone. I wish I could have held onto their greatest flourish. In the same way, I look in the mirror and I do not look the same I did even just two years ago. I wondered what happened. I have been living my life, going along, and something is slipping away from my looks, despite my best efforts. These thoughts remind me to grasp beyond to the tether of my soul, which I know is still there, and deepening.